Buying an acoustic guitar is much like buying a home or a car. While it is not as large of an investment, it is still an investment and it can, if treated properly, last close to a lifetime, or even be passed on to another. Like a home and a car, there are many different factors which need to be taken into consideration when purchasing an acoustic guitar. Your acoustic guitar is not only your instrument; it is also your friend. You will spend countless hours together, and so it is very important that the match is right and that you get along well with your guitar. The best acoustic guitar is not necessarily going to be the most expensive, or the most popular guitar; it is going to be the one that fits your playing style, your playing level and, perhaps most importantly, your lifestyle. To choose the right guitar for your needs, it is important to follow a step by step procedure: there are many aspects of an instrument which will impact your compatibility with it. From specifications to size, and everything in between, the acoustic guitar has the potential to be a complexity, but it can also be made entirely simple. And that’s why it’s important to start off on the right note. The interactive chart below is designed to help you find the best acoustic guitar for your needs. Specifications (also known as “specs”) are the special features that are unique to an instrument. The list of specs provided by a guitar manufacturer can range anywhere from basic, to complex. Usually, with higher end acoustic guitar companies, specs are painstakingly listed out, detailing everything from the woods used to create the instrument to the exact depth of the body and width of the top. Specs are extremely important when choosing a guitar because not only do they make the instrument; they arethe instrument. Higher quality specs will usually mean a better playing guitar, but this is not always the case. While it is true to an extent that you get what you pay for, there are professional musicians who would argue that some manufacturers overprice their instruments, and that cheaper instruments can play just as well, if not better, once properly set up by a guitar technician. So buying the best acoustic guitar is not going to be a question of finding the most expensive instrument in your price range: it is going to be a process which starts with the analyzing of the guitar’s specs. The first spec is probably the most obvious. Guitars are, with a slight exception, made of wood, and as any skilled luthier can tell you, no two woods are made the same. In some cases, woods of the same kind can even be of different quality, and the quality of the wood will definitely be reflected in the price. Some of the woods commonly used in making acoustic guitars include: maple, mahogany, walnut, and rosewood. More exotic woods, such as koa, sapele, blackwood, bird’s eye maple, cocobolo, and ovangkol, are more common in high-end instruments ranging between $600-$3,000. The differences between woods all come down to sound. Some woods, such as mahogany, have a darker tone which is preferred for lows, while others, such as maple, have a brighter tone and are perfect for those higher notes. But no wood is going to sound exactly the same to any two sets of ears, and thus woods specifications are going to have a lot more to do with taste. In order to get a better idea of the sound of a guitar’s woods, it is important to play the instrument both traditionally, or acoustically, as well as plugged in to an amplifier. This will give you a better idea of how well rounded the instrument’s sound is. You will notice that some acoustic guitars sound much better when played acoustically than they do plugged in. This has a lot to do with the woods, but it also has something to do with our next specification: the pickups. The pickups of a guitar are what allow it to make sound through an amplifier when plugged in. Not all acoustic guitars have electronics, and if you don’t plan on playing your instrument plugged in to an amplifier, then this is a specification that you don’t need to worry about. 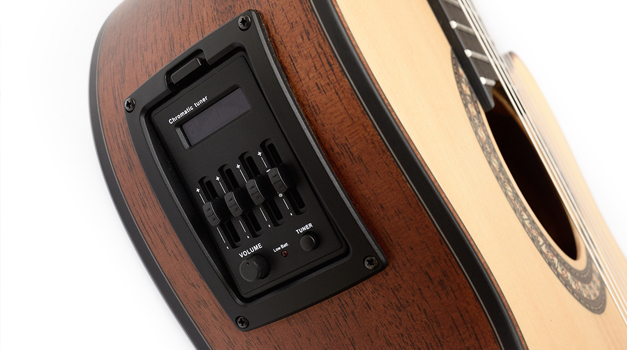 Pickups, like woods, greatly affect the tone of an acoustic. The process of finding the best acoustic guitar has a lot to do with finding a guitar that has a tone suited your ears. Unlike electric guitars, acoustic guitars generally only have one pickup. While active pickups (battery powered, high output pickups) are currently an option, most acoustic guitars that you will find will be using passive pickups, which may have less output but have a more traditional acoustic flavor. 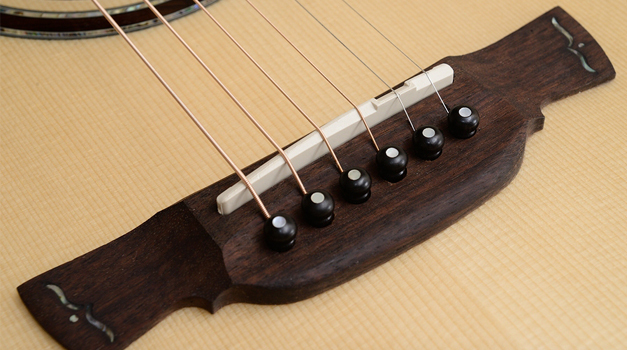 For acoustic guitars, some passive pickups will still require batteries as a power source due to the lack of pots (what are known as “tone knobs” on an electric guitar). When testing out an electric acoustic guitar, it is important to plug in and tweak the amplifier settings constantly, to see how the pickups react to different levels. This will give you a better idea of how the instrument will react in a live setting where it may have to be hooked in to a PA system for better sound during a performance. If possible, try the guitar in a variety of different amplifiers, even if the amplifiers you use are not ones you ever intend to use, as it will allow you to better replicate the audio problems that may be prevalent in a live setting. There are a few specifications within the neck alone that will affect the playability and the sound of the instrument. Firstly, there are the woods used in both the neck itself, and the finger board, or “fret board.” As with the woods used in the body of the acoustic, the woods in the neck and the fingerboard have an impact on the sound of the guitar. Acoustic fingerboards commonly use rosewood in lower end guitars. 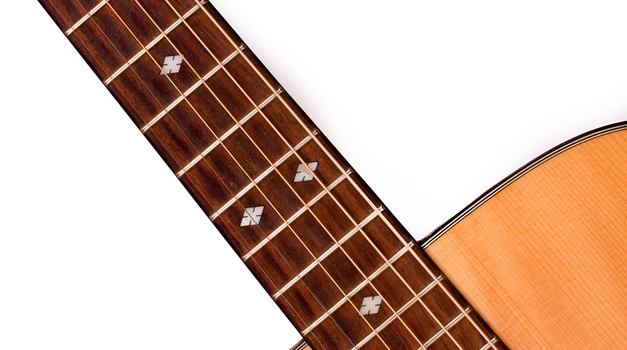 Rosewood is popular due to its soft feel and its general oiliness, which keeps the fret board from drying out over time (though it is still a good idea to feed the fret board a generous meal of lemon oil every six months). Another popular choice is ebony, which is smoother due to having fewer pores. Ebony is mostly found on guitars within the $500 and above range, though cheaper ebony has been known to be found in guitars as cheap as $300. Neck woods have many of the same options and tonalities as body woods: rosewood, mahogany and maple are common neck woods that are very popular in acoustic guitars, but many of the more exotic woods are also used. The best way to choose which woods are best for you is by picking the guitar up and playing it. Pay attention to the overall feel of the neck; if you like the smoothness of the fret board but do not care for the neck itself, find another guitar with the same fret board woods and a different neck wood. Play the instrument for as much time as you can. Generally, when people first pick up a guitar, it has a magical, mysterious and unfamiliar feel which makes them believe the guitar is better than it is, simply because it is something new to them. If possible, come back a few times, spanning your visits a few days apart, to try out the instrument. As long as it is a production instrument, you won’t have to fear it ever disappearing from any guitar store as stores regularly restock their inventories. So even if it sells between your trips, you can always come back again another day to play. The next specification of the neck is the scale length. Scale length has a much larger impact on playing than most players realize. A typical scale length for an acoustic guitar is 25.5 inches, which is the exact same average neck length as an electric guitar. There are such things as short scale guitars and extended range guitars. Generally, short scale guitars are made for people with smaller hands. However, extended range guitars are notsimply made for people with larger hands; they are made specifically for lower tunings, such as C standard or below. The longer scale length allows the looseness of the lower tuning to retain tension over the neck, allowing it to not only stay in tune better, but to also play evenly throughout the entire neck. The last neck spec actually has nothing at all to do with playability. It is called the nut, and it is one of the determining factors in whether or not your guitar will stay properly in tune. Often, when guitarists buy an acoustic, or even an electric, they pay no attention to the nut because it isn’t a piece most realize the importance of. It is a piece of what looks like plastic, but in actuality is usually bone. Many of the high end acoustic guitars use nuts made out of graphite for added tuning stability. However, bone is, according to some, better for tone despite its slightly lesser ability to stabilize tuning. If you are planning on using thick strings, it will be important to get the nut professionally filed in order to avoid damaging it and permanently altering your instrument’s tuning stability. Acoustic guitars do not have very much hardware, and so there is not much that you will have to worry about besides the neck, the body, and the overall tonality of the instrument. But one thing that will definitely have an impact on the tone is going to be the bridge. Acoustic guitars have a generally simple bridge construction. While bridge is the casual term used to describe the entirety of the piece, there are actually a few parts that make up the bridge: the saddle, which is the rectangular block of dark wood upon which the bridge is built; the bridge itself, which is the piece the strings are fed in to; and the bridge pins, which thread the strings into the body and keep them from popping out. Like the nut, the bridge pins are typically made of bone, but other materials, such as brass or graphite, are also used. These do not affect the tone of the instrument, simply the stability of the tuning. The bridge and saddle are usually made of harder woods such as ebony and treated rosewood, which keep the bridge from ripping out of the guitar with the tension of the strings. These woods will affect the tone. Ebony will have a lighter, brighter tone, and rosewood will have a darker and, depending on the quality of the wood, possibly muddy tone. The tuners are usually the only piece of an acoustic guitar not made out of some kind of wood, bone or graphite, save for the electronics if the guitar is an acoustic electric. While there are tuning pegs that are made from wood, the piece used to add or relieve tension on the strings, they are not common. Wooden tuning machines are also available, but currently none are in use on production model guitars, most being made by luthiers for their custom projects or used by custom guitar shops and added on as an optional upgrade. The reason wood is not typically used for tuning pegs is the constant risk of cracking. A cracked tuning peg will need to be replaced, and metal simply does not crack without being subjected to a severe amount of force. Unlike electric guitars, even high end acoustic guitars do not have many options when it comes to tuners. Typically, guitars are fitted with tuners crafted by the guitar company. For instance, Taylor guitars use their own tuners which are simply basic standard tuners made of nickel. Unfortunately, when it comes to tuners on acoustic guitars, you are not going to be left with many options, and so it is important to try a variety of tunings on a guitar to see how it holds up before you commit to buying. 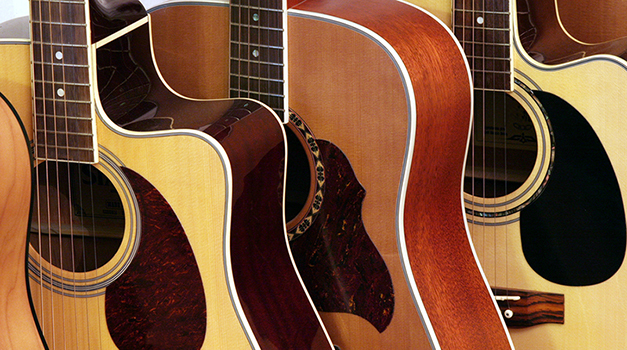 The size of an acoustic guitar’s body has in impact on the guitar’s ability to resonate. Large bodied guitars such as the classic dreadnaught guitar shape, a full bodied acoustic of jumbo proportions, tend to be much louder, and are better for large venues or places where sound has a difficult time travelling well. Cutaway bodies and smaller bodied acoustic guitars in general, tend to sound brighter, and allow single notes to ring more clearly. To find the best acoustic guitar for you, it is important that you consider your lifestyle and your playing. If you play in larger spaces and want to be heard, a larger bodied guitar will fit you better than a smaller bodied guitar, which will possibly be drowned out by your own voice. Pick guards are very common on acoustic guitars, but they are not necessary. A pick guard will not affect the tone of the instrument, and the only thing that it will do, if you tend to scrape your pick against your instrument while strumming, is protect the finish of the wood from your down stroke. Most acoustic guitars, regardless of price range, will come with a pick guard, however if a guitar you enjoy does not, don’t fear; pick “swirls,” the markings left behind by picking, are common on electric guitars and they usually do not show up very well on a guitar’s finish. While specifications take up the bulk of the features of a guitar, the most important feature is actually you. The way that you react to an instrument is important. Specifications are wonderful in that they allow you a base guideline for your potential purchase, giving you an inside look in to all of the parts which come together to make your instrument a whole. But specifications are not the bottom line. Specifications come second to your experience. Learning to listen to your hands and your ears can actually be quite difficult. It is especially hard for more experienced musicians to shut their minds off more so than it is for less experienced musicians due to the fact that experience makes musicians believe that they need instruments on the higher end of the price spectrum. This is not something that will always be true. Seagull, a brand of guitar that makes a varied range of acoustic instruments, is renowned for its top quality in every price range, from the cheaper models to the more expensive models. A more expensive guitar is not always going to be a better playing guitar. Better specs, with more exotic woods, are not necessarily going to make a better sounding guitar. Buying an acoustic guitar involves two factors; your hands and your ears. As mentioned previously, playing a guitar over a period of time will give you a better feel for it and allow you to learn more about what it is exactly that you like about the instrument, why it feels and sounds so good to you, and whether or not it will be a worthy investment. No matter if you are spending $200 or $2,000 on a guitar; you are going to want your instrument to last, to sound great and to play great long after you have purchased it. Play the guitar through an amp if it is an electric acoustic; bring it around to different parts of the guitar store and see how it sounds in the different environments; play pieces of music on it that you know well, and take some time to also fiddle around and have fun exploring it. Play, play, and play some more. 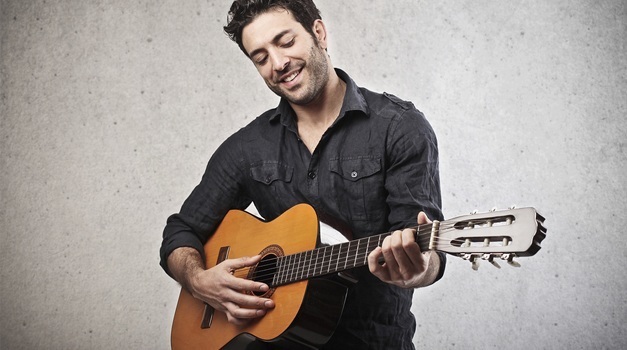 If you have a connection with the instrument, you will know it almost immediately; the best acoustic guitar for you will still be the best acoustic guitar for you even a few days or a week later when you come back to the store and play it again.